I left them a little proud so I could trim them flush with a hand plane. The one I seem to reach for most often is an old No. 3 Stanley outfitted with a Hock blade and chipbreaker. I like the size of my No. 3. It’s ideal for tasks like this. I first trimmed the top edge of the spline flush with the top of the bed rail. This left the end grain. 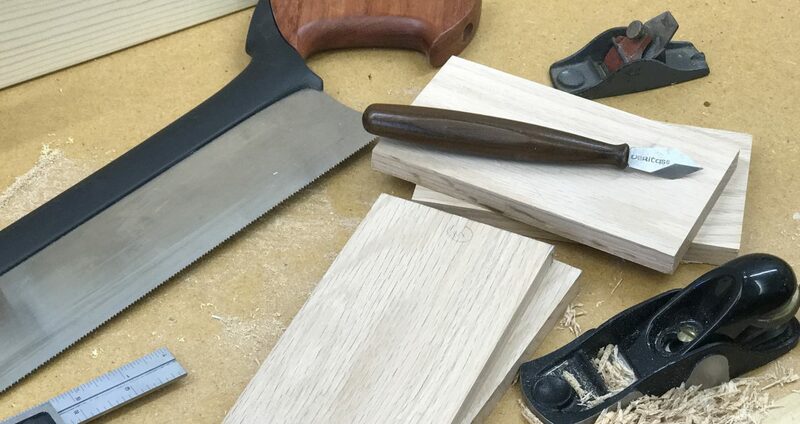 Normally, I’d reach for my low angle block plane or my old Stanley 60½, but since I had the No. 3 in my hand, I thought I’d give it a try. I think it worked better than the block planes would have. The biggest reason is the additional mass the No. 3 brings to the ballgame. It was effortless to take thin shavings off the end grain of poplar. (Another reason why I like using poplar…but I’ll save that for another post.) And the No. 3 isn’t really that hard to handle because of its smaller size compared to other smoothers. As a matter of fact, its footprint is about the same size as the low angle block plane. I think the tote places the hand in a position better suited for forcing the plane through end grain. The bottom line is, I’ll take my No. 3 over most of my other planes. Posted on February 11, 2010 February 22, 2010 by Randy MaxeyPosted in WoodworkingTagged Hand Planes, Woodworking.